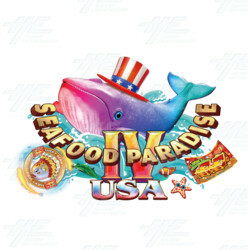 Seafood Paradise 4 USA Edition is a fish hunter style arcade game, where players must use the gun to shoot at various types of fish including monsters like the volcano beast, flame dragon, lucky fish and many more. Seafood Paradise 4 is part of the Seafood Paradise series, and the next upgrade from Seafood Paradise 3. It displays attractive marine graphics and clearly definited and detailed underwater scenes to impress all players. Chain Lightning - continuously attacks fishes in the field. Octopus Bomb - If the Octopus is killed, it will drop a bomb and will get mad and fool around. Players can press the attack button to make the bomb explode. Devastating Bomb - If the inflated Red Octopus is killed, it will explode the Devastating Bomb. This will kill all fish in the field. Viking Ship - When attacked, there is a chance the Viking Ship will randomly drop treasures. If players can successfully break it, they will win a high score award. God of Wealth - Players must press the attack button to shock the treasure bowl. The God of Wealth will then randomly send out rewards. Volcano Beast - Hitting the Volcano Beast will cause rocks to fall with attack effects. Defeating the Volcano Beast will give x200 reward and lead full-screen rock attack. Lucky Fish - Killing the fish gives players a x2 - x10 bonus reward for any type of fish. Flame Dragon - gives players a x200 - x800 bonus reward. Lucky Card - If players scratch 3 identical prizes on the card, they win a prize. There are 3 chances to win.